EBook Details Scroll down this page to write a review for this book. This is the story of a young tick and his family. 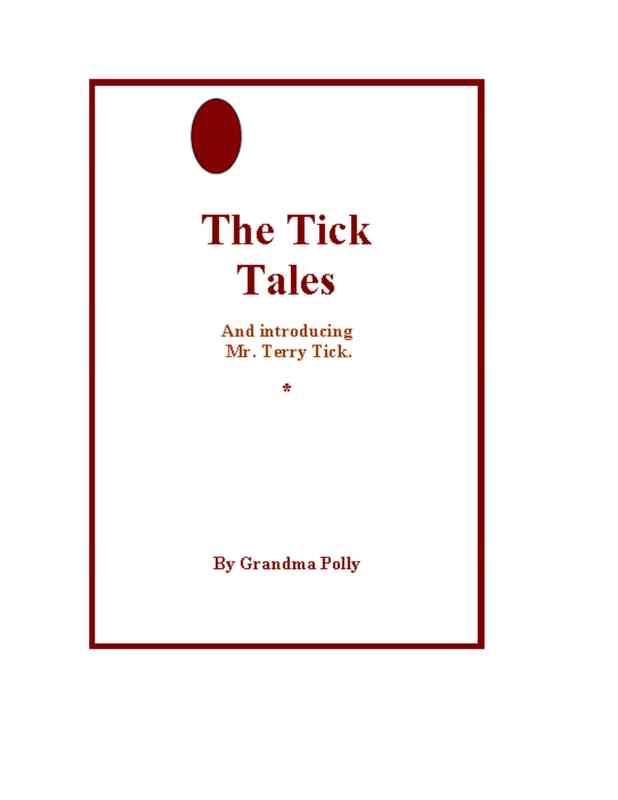 IT also tells of a tick business that resulted in the creation of the tick family. You'll enjoy the spoof on words all through the story. Ticks Inc. was the brain child of Mr. Morton Forge back in 1978. He had wandered into the woods one day, just meditating on the levels of existence of man. What does man really know or do with his existence on this planet. Is he here to merely live and die or does his carma mean that he has a much higher calling. Then suddenly a small little creature crawled up his leg and stuck his head into Morty's leg. "Ouch", Morty exclaimed. "You've got a lot of nerve, who do you think you are anyway?" Brushing the tick off, Morty got a terrific idea! "Why not raise Ticks and sell them to unoccupied countries." So that's the way Tick's Inc., became a reality! Review this book below. While the author greatly appreciates your review of their work here. If their book is on Amazon or another larger venue, please make sure to review it there also. You can review it on Amazon even if you did not purchase it there. To find their book on Amazon or Smashwords, just click on the appropriate link next to their book above. Posting the same review here and on Amazon is fine. Thanks for supporting new Christian writers. IMPORTANT: The following comment box is for reviewing the book on this page only. Please do not leave any other comments here or try and contact the author by leaving a message here. If this book is in the Free Reads for Reviews program and you wish to participate, please click on the authors name next to their book above. You will be taken to their profile where you can send them a private message requesting a Free Read for a Review. Please also read the full instructions for Free Reads for Reviews HERE. Please start your review by listing the title of the book being reviewed. Doing so will allow readers to know which book this review is for on our collective review page.